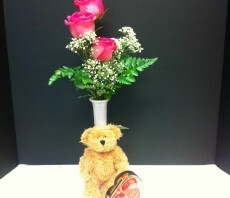 The Precious Heart Bouquet is a blushing display of loving kindness. 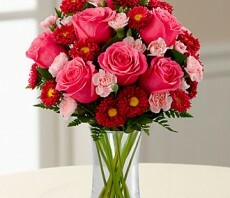 Fuchsia roses are sweetly stunning among red asters, pink mini carnations and lush greens. 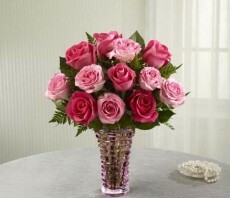 Arranged in a classic clear glass vase, this bouquet boasts pink perfection. 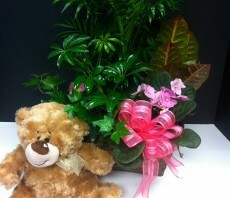 An assortment of tropical leafed and flowering plants displayed in a wicker basket accompanied by a plush teddy bear. How could this not brighten someone's day. 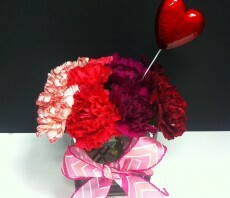 This arrangement is all lace and frills. 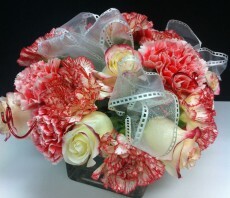 A wonderful combination of carnations and red tipped roses and lace-cut ribbon make this the perfect gift for some that prefers the softer, more delicate things in life. 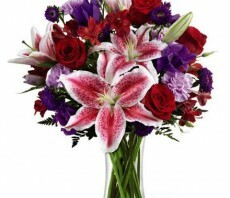 This cute display of a dozen carnations in shades of red arranged in a clear glass cube vase is the perfect gift of love for Valentines day or any day that you want to show someone you care.